It has been said that this election year is perhaps the most important presidential election in over 100 years. The reason is not simply the political differences between the Republican and Democratic candidates, but because the individual who takes office on 20 January 2017 will have, in all likelihood, the opportunity to appoint three and perhaps as many as five justices to the Supreme Court. In addition, that person will also appoint countless judges to the lower ranking federal courts. It light of this, Our Republican Constitution is an important read for everyone who intends to vote in November 2016. Even those who either choose not to vote or do not meet the legal requirements to vote will find this book to be a worthwhile read. Students reading it for a civics class, a college student reading it for a course about American government, or even lawyers and judges will be glad they read this book. Readers will be able to clarify their understanding of the principles set forth in the Constitution by reading this book. They will come to understand the historical developments regarding the interpretation of the Constitution by reading Our Republican Constitution. Needless to say politicians and pundits who do not understand how the Supreme Court arrives at some of its almost unexplainable decisions will find this book provocative. It needs to be reemphasized that this book is not about voting democrat or republican. It is about interpretation of our founding documents and judicial philosophy. The judicial philosophy of each nominee to the court has profound implications for the future of the United States of America! Why is judicial philosophy so important? It is important because according to the author there are two visions or interpretations of the phrase “We the People.” The differences between the two are remarkable and overpowering. Barnett holds that the two interpretations focus on the concept of “popular sovereignty.” He notes that these two interpretations deal with the essence of the Constitution itself. One he calls the visions the Democratic Constitution and the other the Republican Constitution. He states that the labels should not be considered as partisan. At first blush this may raise eyebrows, but Barnett, a well-known lawyer who has practiced before the Supreme Court, uses the Court’s decision concerning the Affordable Care Act (Obama Care) as a basis for his argument. Especially significant is Chief Justice John Roberts’ deciding opinion. Mr. Barnett uses this decision as the case study around which he builds his argument. This provides a reasonable amount of cover for his previously stated non-partisan statement. The author tells us that the argument about the two, Democratic Constitution interpretation and Republican Constitution interpretation, dates back to the founding of the American Republic itself. The reader should recall that prior to the American Revolution sovereignty, at least in the west, was thought to be derived from God, thus the notion of Divine Right of Kings. Our founding documents rolled this view on its head. After the Revolution and the rejection of the British King, a new source of sovereignty was established. The Founding Fathers held that sovereignty was derived from the people themselves. It goes without saying that the people needed to institute a government to rule them, yet at the same time, the people were the ultimate rulers. This may seem like a contradiction, but Barnett duly recognizes this. He explains why this is not so. It is this apparent contradiction that is the root of the controversy between the two interpretations. Thus we get the notion of the Constitution being a living document based on prevailing and contemporary popular wants and desires. Unfortunately, the author does not present a different view of “living document.” He should have discussed in detail how Article V of the Constitution also makes the Constitution a living document. After all it has been amended 17 times, not counting the first ten that we call the Bill of Rights. The Republican Constitution he argues is the view that the idea of We the People holds that sovereignty rests in the people as individuals, thus elected officials are but a subset of the people. They are elected as servants or agents of the electorate. Powers are delegated to these elected officials which they are not supposed to abuse or use for their personal benefit. Thus their primary duties of elected officials are to protect personal and individual rights from being violated either by domestic or foreign transgressors. Understanding the difference between these two views of We the People is essential to comprehending the author’s argument. In addition, appreciating the difference between the two interpretations is essential to realizing how the courts reach many of the decisions they render. The author holds that this is important for the voter also because when one casts his or her ballot they are also voting for what the term popular sovereignty means to them. Although the entire book is quite interesting there are sections that the reader may find more so than others. For example, the author discusses the difficulties associated with the Articles of Confederation that were in place from 1776 to 1789 when the Constitution was adopted. The Articles reflected the principles of a republican constitution to the extreme. It did not work as the 13 states were in continual disagreement with each other. It was, therefore, quite obvious a new form of governance was required. The task of devising a new form of government fell upon the shoulders of James Madison. The author does a superb job of presenting the reader with the mental and philosophical anguish he went through to draft our Constitution. Unfortunately, however, the author missed a great opportunity to discuss a critical element of this process. Specifically he should have covered both the Virginia and New Jersey Plans and thence the Connecticut Compromise. Had he done so, the reader would gain a better understanding of the original differences between the republican and democratic theories underpinning our constitution. Another interesting section was his chapter Losing our Republican Constitution. The author incorporates Supreme Court cases into his discussion thereby helping the reader better understand his argument. Further he describes the role President Teddy Roosevelt plays in leading the progressive movement in reshaping and thereby shifting the interpretation of the Constitution from a republican to a democratic one. There is an interesting irony here. Barnett notes that many of the changes President Teddy Roosevelt tried to make were thwarted by a congress controlled by his own Republican Party. Enter President Franklin D. Roosevelt, cousin of Teddy Roosevelt, and his progressive attempts to further the interpretation toward the democratic philosophy. He was thwarted by Congress then controlled by members of his Democratic Party. What makes this so interesting is that members of both political parties have actively worked to have the Constitution interpreted as reflecting sovereignty, We the People, collectively rather than viewing it as the people individually. The collective interpretation is currently the prevailing view by a large number of jurists and it explains many of the difficult to understand Supreme Court decisions rendered in recent years. Further it helps us understand why the principle of checks and balances has diminished over time. 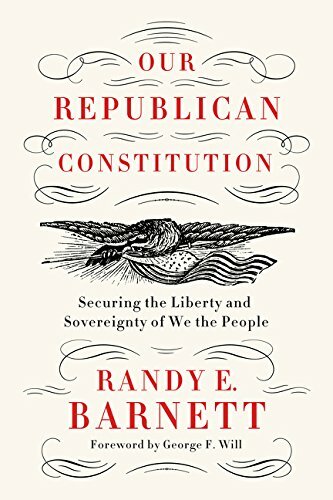 Randy Barnett believes that the original interpretation of We the People was as individual citizens not as a collection of citizens. Thus sovereignty rested not with the people collectively, but as individuals. This is the Republican Constitution. He contends that the modern interpretation is that of a Democratic Constitution that is not what the Founders intended. He lays out a logical, well supported, and easy to understand argument for his position. Perhaps Barnett is incorrect. The best way to determine whether he is correct is by reading this book. Maybe the better question is what do you believe and why? There is an old saying that goes like this “Know what you believe and know why you believe it.” Do you agree with the notion of republican constitution or do you support the idea of a democratic constitution? This is a very important question for you to answer. So why not read this book? You will find it well worth your while.